No, this is not a derogatory term. It is actually a scientific category in Plants of the Pacific Northwest Coast by Pojar and Mackinnon. 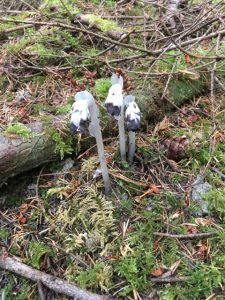 And last week while hiking in a local forest a particular species of oddball was popping up everywhere. “Oddballs” according to this popular botanical guide are plants that cannot turn sunshine into food. They are not green and contain no chlorophyll. Instead of being capable of photosynthesis, they get their nutrition in a variety of ways—by being insect eating, or saprophytic (living on dead and decaying vegetation), or parasitic (getting nutrition from a living plant/tree). 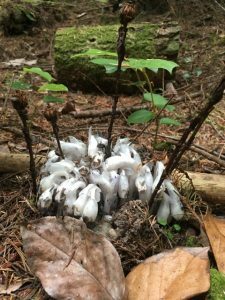 Indian Pipe or ghost plant is parasitic. 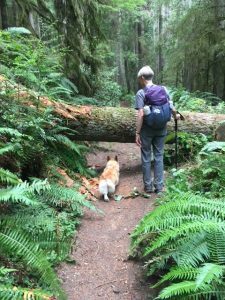 It obtains its nutrition indirectly from the roots of Douglas fir, western hemlock, and other conifers. Indirectly? Yes, these little ghost plants connect to conifers via microscopic pipes formed by a combination of fungal filaments and plant roots. These microscopic pipes are called mycorrhiza (meaning fungus-root). Oh the mysteries of what lies beneath our feet in the forest! The remarkable neural network of the forest is just beginning to be understood by scientists. 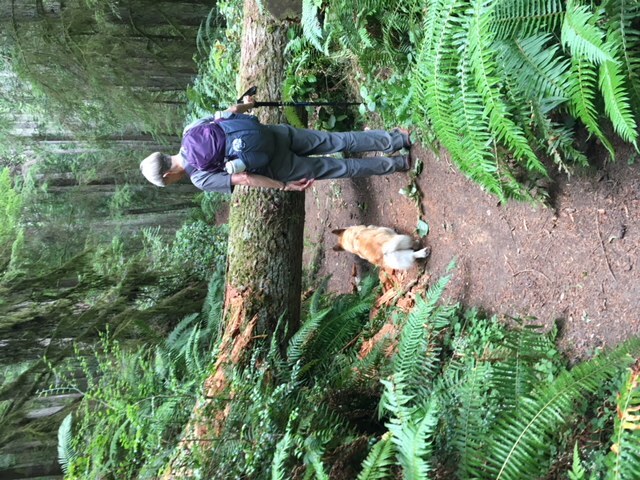 The work of Dr. Suzanne Simard, University of British Colombia, on communication and nutrient exchange between trees and other plants in the forest will be the subject of another blog. Last month my blog was about walking through the forest at the moment that my namesake flower, Linnea borealis, was blooming everywhere. This month it was my great good luck to be walking during the time of the bloom of the ghost plants. A walk in nature is an open door to wonder and mystery always waiting for us to walk through. Oh Ann i love that last sentence so much – so true. and so beautifully put! And thank you for showing us these amazing little oddballs, and uncovering a little bit of their mystery. You have taught this for many years and to so many (I for one, with gratitude) – a most valuable learning and relearning – thanks for this reminder, Ann! For me, reading this, after your last post on the synchronicity of being in the right place at the right time to see your namesake flower, I think of this past week’s lunar eclipse – supposedly the longest duration of this century, and think there might be another such synchronicity at work. And that you, dear Ann, are witness to, and name for us. Thank you. PS – love C’s photo of you and Gracie. I will never forget first seeing Indidan Pipe in the Adirondacks of upstate NY when I was about 8! 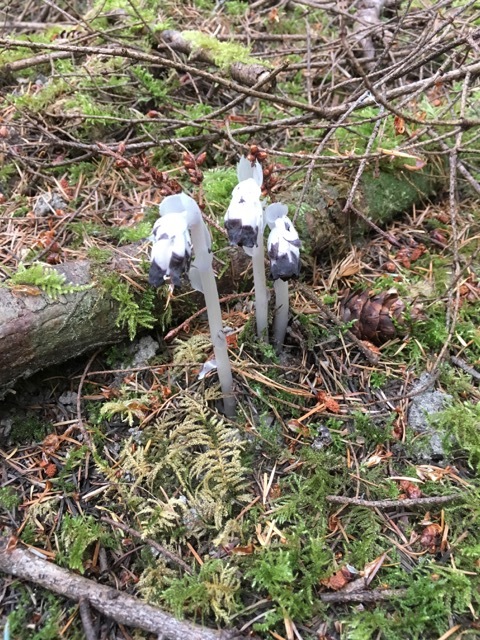 Recently, on the Women’s Vision Fast at EarthTeach Forest Park near Ashland, OR, we saw a new plant several places that sprang up and only lasted a couple of days before disappearing completely: complete white and no chlorophyll. Very beautiful and we wondered if it was fungal in nature.